The Hailstone Schell Station. Photo by Cole Good, 2015. On December 18, 2003 the Issaquah Landmarks Commission met at the Issaquah Depot to discuss proposals to name two historic Issaquah buildings as City landmarks. The buildings under discussion were the Depot and the Hailstone Feed Store. Both buildings were granted landmark status. The feed store building, located on the east side of Front Street, may have been constructed as a residence in the late 1890s. Starting in 1903, Nicholas Burke owned the property and used the building as a warehouse. Burke was the child of Irish immigrants and he operated a grocery store in Issaquah until his death in 1923. The main store was located across the street, where today’s Village Theatre is. After Burke’s death, the warehouse was purchased by Susan Augustan. A 1930 Sanborn insurance map indicates that the building was being used as a grocery store in that year. By 1940 it was being used as a four-room family dwelling. In 1941, Frank Hailstone and his sister, Nell Hailstone Falkenstein, purchased the building. In 1942 it reopened as the Hailstone Feed Store and Shell Gasoline Station. Frank operated the feed store along with his brother James, and his brother-in-law David Lewis. 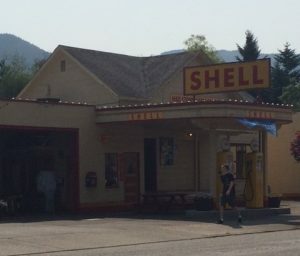 Nell, who was a widow, operated the gas station. Family members operated the business until 1966. The feed store remained in operation under various owners until 1990. 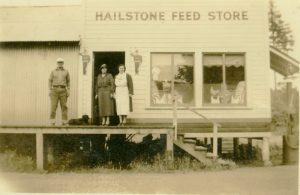 Today the City of Issaquah owns the Hailstone Feed Store building. The Downtown Issaquah Association (DIA) currently leases the building and will restore it to its 1944 appearance. The building will then be used as DIA’s main office, gift store and museum. One of the most exciting discoveries the group has made is an Owl Cigar sign painted on the back of the building. 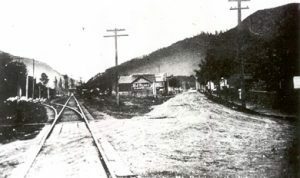 The advertisement would have been easily visible to passengers taking the train in or out of Issaquah, the chief mode of transportation at that time. It was probably applied during the time that Nicholas Burke owned the building. If you are interested in finding out more about this restoration project, or if you would like to donate time, funds, or materials, contact the Downtown Issaquah Association at 425.392.1112. Source: City of Issaquah Landmark Registration Form.